The Volker medal of the 2018 International Hydrology Prize of IAHS/WMO/UNESCO is awarded to Professor Andreas H. Schumann. “For pioneering contributions to water resources research for the benefit of society”. 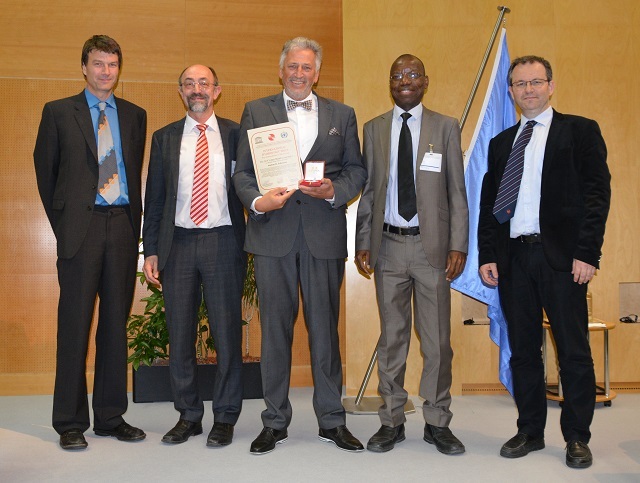 Left to right: Johannes Cullmann (Director, Climate and Water Department WMO), Günter Blöschl (President IAHS), Andreas Schumann (Volker Medal Recipient), Abou Amani (Chief of Section HSS, UNESCO), Christophe Cudennec (Secretary General IAHS). Photos courtesy of WMO. 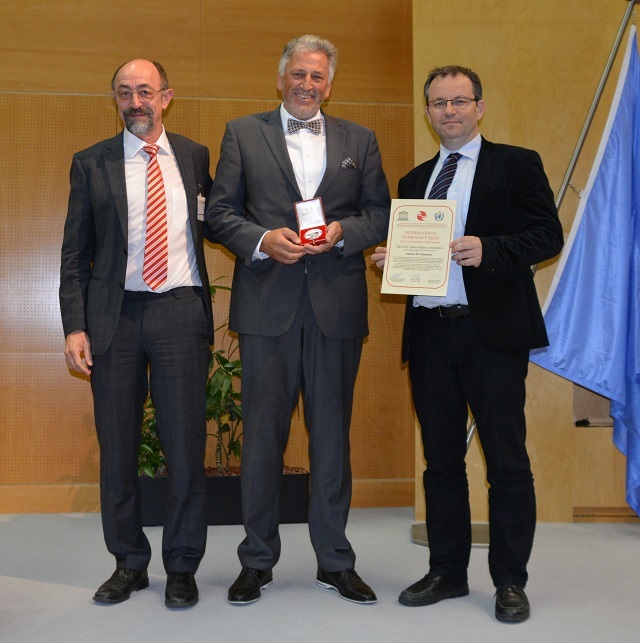 It is an honour to present Professor Andreas Schumann of the Ruhr Universität Bochum as this year’s recipient of the IAHS/UNESCO/WMO Volker Medal. • He has made impressive contributions to hydrology, which have gained him universal recognition as a leading scientist. • He combined scientific and practical work to the benefit of society, as both a water scientist and water engineer, with very substantial impact on society. • He has made outstanding contributions to the hydrologic community as demonstrated by his long-term active involvement in the work of IAHS and other associations. From the very start of his career, Andreas Schumann, has been very active in combining scientific and practical work to the benefit of society. During the early 1980s, he headed the Water Management Directorate in Magdeburg where he was responsible for the East German part of the Elbe River. In this capacity he initiated and led the development of early computer-based tools for river basin management and water control in close cooperation with the Institute for Water Management in Berlin. This was at a time when water management in other river basins was still quite fragmented. He pioneered a holistic approach of combining a diverse set of management goals, something that decades later became mainstream through the European Water Framework Directive. When Andreas Schumann moved to Academia in the late 1980s he first dedicated his research activities at Bochum to developing new concepts of climate impact assessment. Together with researchers from the University of East-Anglia and the Institute for Hydrology in Wallingford he estimated the uncertainties of impact assessments by constructing an early model ensemble system. Recall, this was at a time when people were still sceptical at the thought of water management impacts of climate change, and ensembles were a concept at that point unknown. Andreas has been a visionary and history proved him right. The impact assessments and the focus on uncertainty had important practical implications for water management in Germany. Climatic variation effects on water supply from reservoirs were taken more seriously and implemented in design and strategic management plans, e.g., in terms of drought potential assessments. His concepts also had broader international repercussions. He anticipated what is now becoming a global research thrust through the Panta Rhei initiative of IAHS on change in hydrology and society. In the last decade, Andreas Schumann’s continuing interest in combining scientific activities with water management steered him towards developing novel computer-based decision support systems for river basin-based planning, comprehensive risk analysis of water management systems and flood statistical research. Many of the activities of Andreas Schumann at the crossroads of science and practice in the last decade were dedicated to flood research and it is there where he received very substantial recognition both in Germany and internationally. He was appointed to the Committee on reservoirs of the German Institute for Standardisation (DIN) – one of the prominent standardisation bodies worldwide. In this capacity he played a leading role in devising the new design criteria for dams in Germany that were published as standard DIN 19700. After the catastrophic flood in 2002, his seasonal flood estimation approach was the main design method in the strengthening of the levees in Saxony, and the June 2013 flood proved the design right – a fine example of the impact of his research on society. The flood research of Andreas Schumann has indeed had very substantial practical significance and his impact is wide reaching. The Probability Weighted Moments along with a new estimation method he introduced have long become the standard approach in German flood statistics and is used in a number of countries. His variant of Copula statistics is similarly widely used, as is the flood estimation software he developed at his institute in Bochum. As the chair of a working group of the German Association for Water, Wastewater and Waste (DWA) he masterminded new guidelines on estimating flood probabilities which invoke substantially more process understanding of flood generation than previous guidelines have done – a clear reflection of how science can be purposefully used to make better predictions of practical relevance. Andreas Schumann has also made outstanding contributions to the work of IAHS. He has been an officer for over twelve years providing global leadership in his capacities as Secretary of the International Commission on Water Resources Systems of IAHS and currently as its President. Over the years he organised numerous IAHS symposia and workshops, the proceedings of which appeared in the Red Book series of IAHS. For example, in 2016 he organised the 7th International Water Resources Management Conference which was a resounding success. Andreas has also served the hydrologic scientific community in other forums, e.g. as a sought after reviewer for numerous research foundations. He has been similarly active in serving the international hydrologic community from a more practical perspective to the direct benefit of society, e.g. as a consultant to the World Bank, inter alia, on analysing alternative strategies for using the hydropower potential in Southeast Europe. He is simply the most eminent German hydrologist at the crossroads of science and practice with immense international visibility. Andreas Schumann is a personality with amazing power and drive. He has made very significant contributions to hydrology, in particularly in the area of flood estimation, which made him an international leader in the field. He is therefore is a very worthy recipient of the 2018 Volker Medal. The citation reads “for pioneering contributions to water resources research for the benefit of society”. I am very glad and grateful to receive this award from IAHS, UNESCO and WMO today, in front of this esteemed audience. When I look on the list of people who received this International Hydrology Prize before me, I see so many great names. People who were or still are leaders in hydrological sciences and pioneers of new scientific developments were honoured with this prize. Having this in mind, I fear that I may not deserve this distinction. 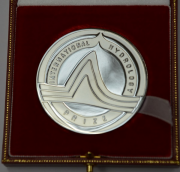 Fortunately, the hydrological prize has two categories and the Volker medal which I receive today, is dedicated to hydrologists who have applied their research and hydrological expertise to the benefit of society. I was always attracted by practical questions, which had to be answered in time. These tasks led me from station to station in my professional life and several times gave me the opportunity to produce a tool, a methodology or an expert’s opinion, which was accepted by practitioners. By chance, I receive this prize in the framework of a conference, dedicated to hydrological networks. I am aware that all of my work and my small methodological developments are based on hydrological data, someone else had collected for me over decades. Without a countless number of observers, underpaid, but often very enthusiastic, there would be no hydrology and no modern water management. These people will never be given a hydrology prize but deserve our full respect and gratitude. Günter Blöschl mentioned in his citation that my activities can be located at the crossroads of science and practice. This sounds good but describes a difficult situation. You will be challenged at this crossroad by two different aspects: at one side the basic research, which requires more and more complex methods, and demands a deep understanding and often a long training to use them; at the other side the applied research, which has to bear in mind the interests of users, who will use the results only if they are tailor-made to their needs, understandable and (this is the most difficult problem) not too far away from their expectations about the outcome. Trying to bridge this gap, you will be faced with two groups of arguments: your work has a poor theoretical background; and your work is too theoretical and has no practical use. The main advantage in this situation is that you could transmit these arguments directly to your colleagues in science or practice, which will definitely not increase their sympathy for you. However, you have also to cope with another and more crucial problem: with the certainty of uncertainty. As a good scientist you know exactly how well we don't know things. I always wonder how well I understood hydrology, when I received my PhD. All things were clear: there were rules described in textbooks which were (of this I was in no doubt) followed by nature. Forty years later, I know how many things I don’t know in hydrology and this is very, very scary. It is difficult to explain my deficits in knowledge to potential users of the results of my research. Engineering is based on crisp numbers, not on uncertainties. A design flood has to be specified in a discharge value, given in cumecs and not by a fuzzy number (even if the fuzzy number would be most appropriate in many cases). One example of my failure in this matter is my attempt to understand climate change. In the early nineties I had the big chance to cooperate with the Institute of Hydrology in Wallingford, U.K., and the University of East-Anglia in an EU-funded research project. Mike Hulme produced not less than 25,000 regional climate scenarios for me, based on 14 different GCMs with 9 different assumptions of climate sensitivities, using 9 emission scenarios. We (my PhD-students and I) used these scenarios by transferring them with a hydrological model into changes of the water balance of the upper Danube basin. In this way, we were able to characterize the uncertainties of these climate projections, based on such a model chain. It was an early ensemble approach, which has been done several times in the last decade in a much more comprehensive way by other researchers. At the end of the nineties, our results were considered controversial. At this time, many scientists were able to make forecasts of the impacts of climate change in the year 2100, based on one climate model, a correction of biases and simulations with one hydrological model. Our approach was methodologically visionary but not in the mainstream of research and so it was never accepted. Soon I recognized that there was an unbeatable argument with which to introduce new methods into practice: their evidence by data. In this way, I was lucky enough to convince experts from both sides, from science and practice, to accept some new approaches in flood statistics. In the late nineties, I was appointed to the Committee on Reservoirs of the German Institute of Standardization. We developed a new German Standard for the design and operation of reservoirs. I was the only hydrologist in this board and discussed especially the question of design floods with a group of 20 or 30 practitioners, who always had in mind the costs of any changes to the previous design practice. After long discussions, we specified a design flood for the proof of structural stability of dams with a return period of 10,000 years. The draft of the standard was published at the end of the year 2000 for open discussion and everybody who was responsible for a reservoir, found a flood with a return period of 10,000 years not acceptable. This topic was controversially discussed until July 2002. In August, an extreme and devastating flood occurred in Eastern Germany and Bavaria, resulting in economic damages of more than 9 billion Euros. Using the statistics based on a time series until the year 2001, the return period of this flood event at many gauges was very much higher than 10,000 years. This flood event stopped the discussion about the new flood design immediately. I was given the mandate by the Federal State of Saxony to specify new design floods which were urgently needed to re-build dams, dykes and bridges. The boundary conditions were difficult: the results were needed immediately, but the statistical methods, which were used before, were obviously insufficient. Some years earlier, in 1997, I had tried probability weighted moments, proposed by Wallis and Hosking, for flood statistics in Germany, but nobody took notice of my publication. Now this more robust approach to estimate parameters of a distribution function became very useful. We introduced also a three parametric distribution function, the General Extreme Value distribution, instead of the Gumbel distribution, which was used before. When I visited the flooded regions, a colleague showed me flood marks dating back until 1771. Here I learnt that in this region nearly all extreme floods were summer events. Why not differentiate between seasons in flood statistics and combine the results? We did it and gained not only new results but also new insights into flood statistics. The application of the new methods reduced the return period of this event into a range between 300 and 500 years and became part of the new German guidelines on estimating flood probabilities, published in 2012. In finalizing this response, I express my gratitude to all persons who supported me in my career. This was first of all my academic teacher, Professor Siegfried Dyck, who was awarded the International Hydrology Prize in 1992. As a civil engineer, he directed me to engineering hydrology. Someone else who gave me strong support is Professor Gert Schultz, who was awarded the International Hydrology Prize in the year 2005. Joining his institute in 1989, I found perfect working conditions there. Twelve years after I had joined the institute I was selected by our faculty to become his successor, which was (and is) quite unusual. Both role models were active members of IAHS, and so I became one. I always enjoyed the work in IAHS: I met many interesting scientists, got their results directly by attending conferences and even more importantly I made friends all over the world who gave me their response to my work, asking the right questions to direct me and support me in many different ways. Among them, Günter Blöschl played the most prominent role! In other scientific societies, you meet colleagues, in IAHS you meet friends! So, it is very easy to explain why I organized several IAHS workshops and symposia: to meet my friends! It was an extreme honor to stand here in front of you today. I thank everybody who contributed to this event, and every one of you for your patience.